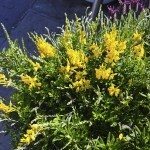 When and how should you prune a broom shrub? My broom is beautiful but has taken over! I need to get it under control before my climbing rose vanishes behind it! 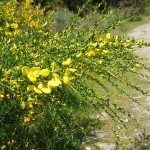 A broom shrub should be pruned when dormant (late winter, early spring) but it will not hurt it to prune some now, if you need to. The best way to prune it is to remove some of the oldest branches/stems/trunks all the way back to the ground and then shape the remaining into the size you need it to be.